As a one year-old project, Planes on Paper was already receiving high praise from a nearly endless list of media outlets across the country: The Seattle Times, American Songwriter Magazine, KEXP Seattle, WNYU New York, The Revue, Ear To The Ground, and The Stranger, to name just a few. 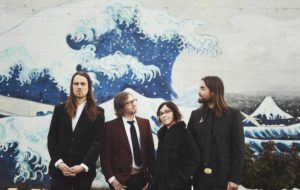 Now 2.5 years into the band, the praise continues, and the songwriting duo is drawing crowds on both coasts of the US as well as playing some noteworthy festivals… all without yet releasing a full-length album; that unconventional path speaks volumes about the strength of Planes on Paper’s live performances. Described as, “a cohesive, stark showcase of pure, unadulterated song craft,” they are a show not to be missed.